Carotid artery stenting (CAS) has emerged as an endovascular treatment alternative to carotid endarterectomy (CEA) for the management of atherosclerotic obstructive extracranial carotid artery disease. Evidence is accumulating in support of its efficacy in preventing stroke. Stroke is the third leading cause of death (164,000 deaths/year) in the U.S., behind heart disease and cancer. There are approximately 1 million stroke-related events each year, including 500,000 new strokes, 200,000 recurrent strokes, and 240,000 transient ischemic attacks (TIAs). Carotid occlusive disease amenable to revascularization accounts for 5% to 12% of new strokes. Patients with temporary retinal or hemispheric neurological deficits should be screened for extracranial carotid artery disease. In asymptomatic patients, there are no guidelines to support routine screening for carotid artery stenosis, except for some patients scheduled for coronary artery bypass graft surgery (CABG). Prior to CABG, carotid duplex screening is recommended in asymptomatic patients with age greater than 65 years, left main coronary stenosis, peripheral arterial disease, history of smoking, history of TIA or stroke, or carotid bruit. In other patients with asymptomatic carotid bruits, diagnostic tests for carotid disease should only be performed in those patients who are also considered good candidates for carotid revascularization. Noninvasive imaging is useful to assess carotid stenosis severity and guide treatment. Carotid duplex is the most widely available and least expensive noninvasive imaging procedure. When carotid duplex results are unclear, diagnostic accuracy may increase to greater than 90% when it is used in conjunction with computed tomographic angiography and/or magnetic resonance angiography. Vascular laboratories must have strict quality assurance programs to establish optimal internal diagnostic criteria, employ credentialed vascular technologists, and obtain vascular laboratory accreditation. Recognition of normal and variant anatomy of the aortic arch and the cervicocerebral circulation is required for successful performance of carotid angiography and endovascular intervention. 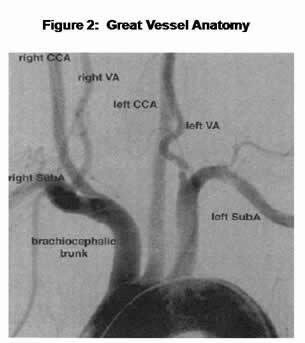 Selective angiography of both carotid arteries was recommended prior to CAS. Cardiovascular risk factor modification to target levels with medical therapy is recommended to limit progression of atherosclerosis and decrease clinical events, irrespective of carotid artery revascularization. Antiplatelet therapy is recommended for symptomatic patients. Either aspirin (81 to 325 mg), extended-release dipyridamole plus aspirin, or clopidogrel can be used. Medical therapy alone is preferred for patients in whom the risk of revascularization outweighs its benefits, including patients who are at low risk for stroke with medical therapy (symptomatic stenosis less than 50%, asymptomatic stenosis less than 60%), and those with a high risk of procedure-related stroke or death due to clinical or technical factors. Current AHA guidelines recommend CEA in symptomatic patients with stenosis 50% to 99%, if the risk of perioperative stroke or death is less than 6%. For asymptomatic patients, AHA guidelines recommend CEA for stenosis 60% to 99%, if the risk of perioperative stroke or death is less than 3%. The 2005 guidelines from the American Academy of Neurology recommend that eligible patients should be 40 to 75 years old and have a life expectancy of at least 5 years. Carotid artery stenting is a reasonable alternative to CEA, particularly in patients at high risk for CEA. Although there are no randomized studies comparing CAS with and without embolic protection devices (EPDs), the use of EPDs appears to be important in reducing the risk of stroke during CAS. Careful neurological assessment is required before and after CAS. The Centers for Medicare & Medicaid Services (CMS) reimbursement is limited to qualified institutions and physicians when using Food and Drug Administration (FDA)-approved stents and EPDs for high-risk patients with symptomatic stenosis greater than 70%, and for high-risk patients (symptomatic stenosis greater than 50%, asymptomatic stenosis greater than 80%) enrolled in a Category B Investigational Device Exemption (IDE) trial or post-approval study. At the present time, there is insufficient evidence to support CAS in high-risk patients with asymptomatic stenosis less than 80% or in any patient without high-risk features. The results of ongoing randomized trials will define the future role of CAS in low-risk patients. Further study is needed in asymptomatic high-risk patients to determine the relative merits of CAS compared with best medical therapy. Operators should previously have achieved a high level of proficiency in catheter-based intervention, complete dedicated training in CAS, and be credentialed at their hospital. Detailed clinical documents on training and credentialing for CAS have been published by 2 multispecialty consensus groups. The elements for competency include requirements for cognitive, technical, and clinical skills, including cervicocerebral angiography and CAS. Hospitals are required to maintain independent oversight of CAS outcomes by a hospital-based oversight committee. The CMS has created facility credentialing requirements for CAS reimbursement. Individual operators and institutions are required by CMS to track their outcomes and to make their data available for submission to a national database.